Have you met Molly Yeh? It’s about time. The Midwestern, American blogger has taken the States by storm in recent years with her inventive, quirky recipes—the kind that stop readers in their tracks and elicit oohs and aahs and “I need to make that”s. 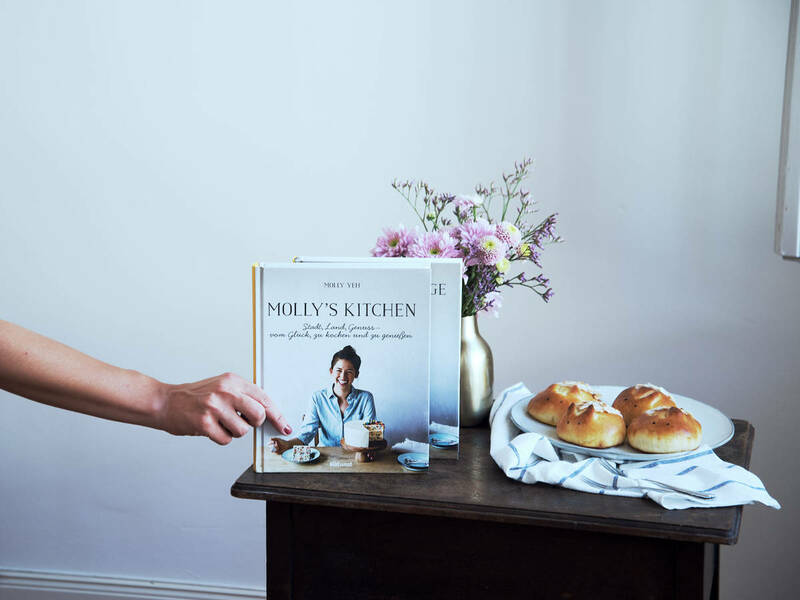 From homey casseroles to eat in front of Netflix to festive cakes for birthday parties—her cookbook, Molly on the Range (Molly's Kitchen in German), has you covered with the kind of food you actually want to eat and share with friends. Want to know more about Molly and her cookbook? Read on for insight, tips, and inspiration for your own kitchen adventures! Molly on the Range tells my story of growing up in the suburbs of Chicago, moving to New York to study percussion, and then falling in love with a farmer and moving to his family’s farm on the border of North Dakota and Minnesota. It contains all of my favorite foods that are inspired by my Chinese and Jewish heritage, my travels around the world, and my new upper Midwest surroundings. There’s a lot of macaroni and cheese, some schnitzel and spätzle, and tons of cake. My love of German culture began when I discovered Mahler symphonies as a teenager. As a percussionist, I couldn’t get enough of Mahler’s music and that turned into a desire to understand all of the notes in his music like, Der Teufel tanzt mit Mir and Langsammer and Schwammschlägeln, so I enrolled in German class in high school and started traveling to Germany as often as I could. I got to travel with my dad, who is also a musician, to Berlin and watch him perform at the Philharmonie and later toured with a concert band all around Germany. I quickly fell in love with the food and so many things about the culture, as well as the people that I met. Funfetti cake! Growing up in the 90s in America, the best birthdays were celebrated with a vanilla cake made with a Betty Crocker mix that had rainbow sprinkles throughout. It was soft and sweet and tasted pretty artificial, but in a good way (haha). Molly on the Range has a homemade version that took me forever to develop. It was way harder than just mixing sprinkles into vanilla cake. An apricot Linzer cookie with a bunny shaped cutout in the center. Flour, sugar, marzipan, all of the baking necessities. And peanut butter and tahini! Which kitchen gadget can you not live without? Which food trend do you wish would go away? Not one specific trend, but it drives me crazy when I see a recipe posted online that was posted for the sake of “just posting content.” Don’t post an avocado toast recipe!!! Unless you truly have something to teach me about avocado toast or a new idea that hasn’t been posted about five thousand times or a very, very, very good story to go along with it. When it comes to food, where do you want to travel next? Anywhere with good goulash, preferably in a cozy lodge on a snowy mountain. What’s the best food experience you’ve ever had? In college, I won a month of free schnitzel from the Schnitzel and Things truck in New York City by being their 5,000th Twitter follower. I ate schnitzel every single day that month, it was the best. What’s the next big thing in the food industry? I am way too stubborn about my favorite foods to be able to have a remotely unbiased opinion of what I think it will be. I want it to continue to be Israeli food. Top food styling tip for that perfect snapshot? Chill a frosted cake before slicing it to get clean edges. Blending it into a milkshake. What would be your last meal and who would you eat it with? Mac and cheese and my family. Have your own answer to any of these questions? Sound off in the comments!